After my leatherworking + Obliterium Forge guide, I got a lot of PM to make one for other professions too, so here is my Tailoring profit guide for turning your crafts into Obliterium effectively. On the Leatherworking guide I posted a fixed price below which you need to buy Stonehide or else you won't profit, but in this, I went one step further! Presenting an excel sheet which automatically calculates the profit for your server! I shared a complete sheet which includes calculator for Leatherworking, Enchanting, Tailoring + Obliterium in Donators area, but this here includes only Tailoring and Obliterium calculations which gets the job done if you have a Tailoring profession and want to make some sweet Obliterium profits. Just open the file in Excel and input your server prices for Obliterium and Shal'dorei Silk for Tailors. 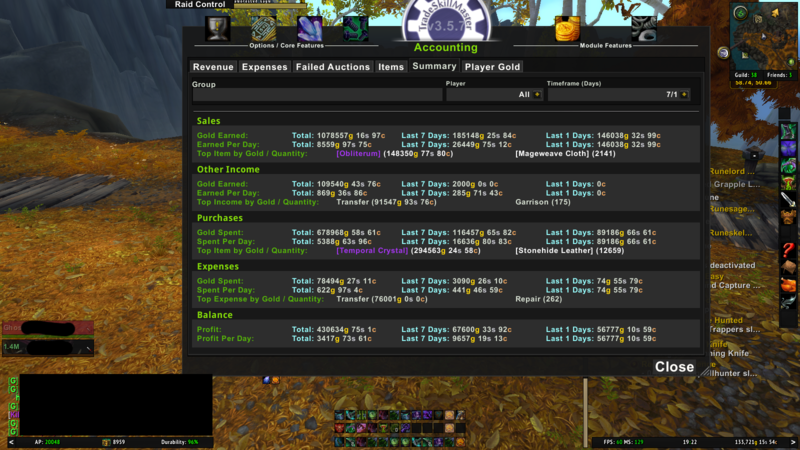 And watch how it automatically calculates your profit for every craft. Replace in the macro above "Warhide Pants" with the item you are recommended to craft in the calculator. Set this as a macro this auto drags the crafted item from your inventory into the forge screen, keep auto loot on in interface now you just have to press the macro button and click obliterate. I suggest bind 1 to this macro temporarily and just press 1 and left click to obliterate. Yes, but Tailoring has nearly 100g profit per craft on my server which is the highest pop EU server, which is really insane. I've been having a lot of success doing this with Alchemy after LW took a small nerf. At least, until the giant wave of dupers flooded and crashed the auction house prices. Thanks for this guide! Alchemy potions and Tailoring pantaloons are the only ones that have a positive profit from Obliterium right now. Use it while it lasts! Can you tell me exactly what the problem is?